ola raiders! vamos começar uma nova serie de reviews! Vamos começar analisando as cartas mais quentes do set chamado ! Esta semana vamos ver Altergeist Multifaker !! You can Special Summon this card from your hand. You can Special Summon 1 "Altergeist" monster from your Deck in Defense Position, except "Altergeist Multifaker". You cannot Special Summon monsters the turn you activate this effect, except "Altergeist" monsters. You can only use each effect of "Altergeist Multifaker" once per turn. Sangan, Magician's Circle, Summoner Monk, Altergeist Meluseek (esta como é lv1 pode ser usada no link summo de linkuriboh e ainda ativar seu efeito de busca), Altergeist Primebanshee, Altergeist Hextia and Personal Spoofing. Se vc usar o efeito de multifaker pra invocar "Altergeist Silquitous'" vc pod devolver multifaker pra sua mao e, desta forma, re-usar seu efeito posteriormente. Você pode também invocar "Altergeist Kunquery" se o seu objetivo for a remoção de alguma S/T problemática. PERCEBEM? Altergeist Multifaker can be added to hand with the graveyard effect of Altergeist Meluseek by Link Summoning Linkuriboh, or simply with Personal Spoofing.Altergeist Protocol can be set onto the Spell/Trap Zone by the effect of Altergeist Marionetter. 2.After Altergeist Protocol is successfully activated, trigger the effect of Altergeist Multifaker, Special Summon it from Hand. 3.When Altergeist Multifaker is successfully summoned, trigger its effect, Special Summon Altergeist Meluseek from Deck. 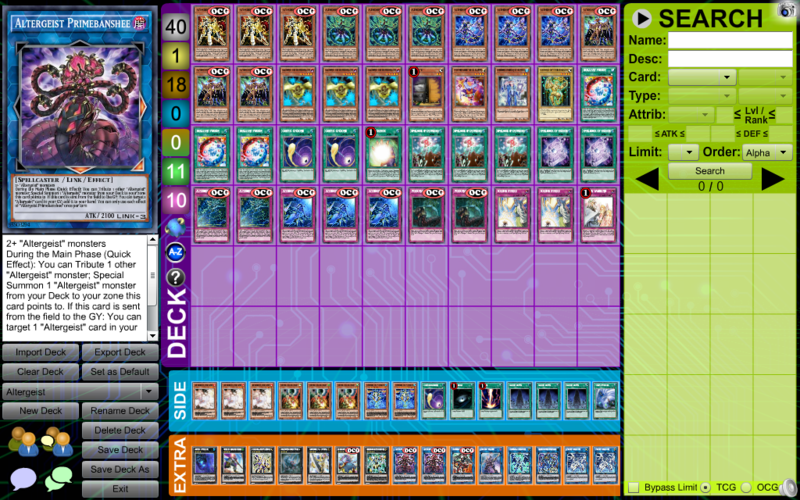 4.Using Altergeist Multifaker + Altergeist Meluseek, Link Summon Altergeist Hextia in the Left Extra Monster Zone. 5.When Altergeist Hextia is successfully summoned, trigger the effect of Altergeist Meluseek, add Altergeist Marionetter from Deck to Hand. 6.Normal Summon Altergeist Marionetter in the 3rd Main Monster Zone. 7.When Altergeist Marionetter is successfully summoned, trigger its effect, set Altergeist Manifestation from Deck to Spell/Trap Zone. 8.Activate the effect of Altergeist Marionetter, send Altergeist Protocol to the graveyard, and revive Altergeist Multifaker. 9.When Altergeist Multifaker is successfully summoned, trigger its effect, Special Summon Altergeist Silquitous from Deck. 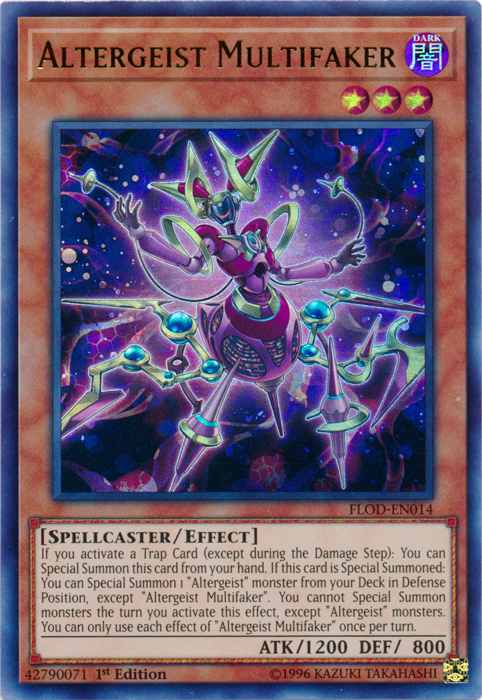 10.Using Altergeist Multifaker + Altergeist Silquitous, Link Summon Altergeist Hextia in the 2nd Main Monster Zone. 11.When Altergeist Hextia is successfully summoned, trigger the effect of Altergeist Silquitous, add Altergeist Protocol from Graveyard to Hand. 12.When the opponent plays a Spell/Trap Card, activate the effect of Altergeist Hexstia in the 2nd Main Monster Zone, tribute Altergeist Marionetter, and negate the activation of that Spell/Trap Card. 13.When the opponent plays another Spell/Trap Card, activate the effect of Altergeist Hexstia in the Left Extra Monster Zone, tribute Altergeist Hexstia in the 2nd Main Monster Zone, and negate the activation of that Spell/Trap Card. 14.Trigger the effect of Altergeist Hexstia, add Altergeist Multifaker from Deck to Hand. 15.Activate Altergeist Manifestation, and revive Altergeist Hexstia in the 2nd Main Monster Zone. 16.After Altergeist Manifestation is successfully activated, trigger the effect of Altergeist Multifaker, Special Summon it from Hand in the 3rd Main Monster Zone. 17.When Altergeist Multifaker is successfully summoned, trigger its effect, Special Summon Altergeist Silquitous from Deck. The Altergeist Hexstia revived and equipped with Altergeist Manifestation can negated another Spell/Trap Card. Altergeist Protocol can negated a Monster Effect. Altergeist Silquitous can bounce a card. ◾3 Altergeist Hexstia to negate the activation of 3 Spell/Trap Cards or effects. ◾Altergeist Protocol to negate the activation of a Monster Effect. ◾Altergeist Silquitous to return a card to hand. ALTERGEIST DECK! MULTIFAKER AND SECRET VILLAGE TOO STRONG!